Richard Parker lives in a small Philippine fishing village. He has extensively studied contemporary seashore foraging, fishing, and bead-making, and has thought and written quite a bit about prehistoric versions of same. Parker riffs on my theory of the origins of money, adding many interesting observations he's made about shells and bead-making along the way. He has some good comments about the debate over whether the older finds were actually beads or the puncture holes were just a result of the way they ate snails. Although he questions the rush of archaeologists to conclude that they were beads rather than worked prey, he concludes that Nassarius, at least, was too small for eating. Piercing them and sucking out the contents would presumably have been more trouble than it was worth. Archaeologists recently discovered similar punctured Nassarius shells in Algeria and Israel that date back to 90,000 to 100,000 or more B.P. The U.S. Supreme Court has decided to hear Massachusetts v. EPA, a challenge by some states in federal court to force the EPA to regulate carbon dioxide even absent specific instructions to do so from Congress. This case is related to the non-delegation doctrine, the origins of which I have written about in a paper. However, the non-delegation doctrine will probably not be reached since the EPA (which like other regulatatory agencies and the Justice Department hates the doctrine, as it enforces democratic oversight) is defending the case. Thus the EPA and its opponents are staking out their arguments around the issue of whether EPA must regulate carbon dioxide, not around the issue of whether it can. Under the non-delegation doctrine as Madison and most other Founders understood it, and as it was understood by the Supreme Court until the late 1930s, the EPA should not be able to regulate carbon dioxide even if it wanted to, absent specific instructions from Congress to do so. Despite the EPA not having properly raised the non-delegation issue, it is highly likely that several court conservatives wish the EPA would raise it, and possibly might raise it themselves, although normally they are loathe to raise issues that the parties have not properly raised. Indeed, the Court (with the concurrence of all the conservative justices) recently dismissed a case because the party based its Supreme Court appeal around an issue that it had not properly raised in the lower courts. However it's possible that an argument of the auto industry intervenors could be construed as properly raising the non-delegation issue, although their argument is fairly narrow: that Congress has already delegated authority over carbon dioxide to a different agency. The state challenge to the EPA was rejected at the circuit court level and has very little chance of succeeding at the Supreme Court, but it will be interesting to hear the various reasons the justices will give for rejecting it. Archaeologists report in this week's Science that they have found shell beads in Algeria and Israel dating back to about 90,000 and 100,000 BP respectively. Humans drilled holes in the mollusc shells which would have allowed them to be strung as beads on bracelets or necklaces. This pushes back the previously known earliest date from 75,00 BP. The shells are from the same marine species as the 75,000 BP shells found in South Africa, suggesting a very conservative or stereotyped tradition (as is also the case for stone work dating this far back). The wide geographical spread suggests origins much earlier than even 100,000 BP. 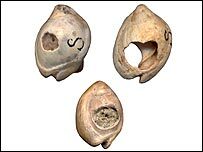 Furthermore, the Algerian shells were found in a cave about 200 km from the ancient shoreline, indicating long distance distribution (whether via trade or other transactions or just transport) of either the unworked shells, the beads, or both. * They differ from many modern legal definitions of "money" (e.g. that of the U.S. Uniform Commercial Code) insofar as they were not minted or authorized by sovereign governments, hunter-gatherer societies having no such entities. * Their primary uses were not for market exchange. Rather, by solving the double (or more) coincidence of wants problem, they solved more basic cooperation problems of kin altruism, reciprocal altruism, and the mitigation of aggression, and thus gained homo sapiens -- perhaps we should be called homo monetarius -- an important evolutionary advantage over homo neanderthalensis and other animals. This is probably also reflected in the human instinct to collect shells and other bright objects, an instinct not found in other primates and an instinct which would have allowed us to gain these advantages in cooperation over other animals. Again my thanks to Ian Grigg for the pointer to this latest news. We are going to have to wait longer for the U.S. Supreme Court's opinion on the section 101 patentable subject matter jurisprudence of the last two decades, in which the Federal Circuit sharply diverged from Supreme Court precedent. That's because the Court dismissed LabCorp. v. Metabolite on a procedural "technical issue," namely LabCorp's failure to properly raise the section 101 issue at the original trial. Justice Breyer, joined by Stevens and Souter, wrote a strong dissent arguing that the case should be decided and the patent's claim to a "law of nature" held invalid. This dissent looks like a passing of the torch of section 101 enforcement from Stevens, the author of Parker v. Flook, to a new generation of justices. Breyer's opinion suggests that he at least vaguely recognizes the Neilson/Morse/Funk/Flook methodology, which the Federal Circuit has long rejected despite the many Supreme Court precedents, including Flook, that upheld it. I'll probably analyze Breyer's dissent in a subsequent post. It is unknown where the other justices stand on section 101, although it's probable that at least Ginsburg joined by some of the conservative justices would have agreed with the Federal Circuit's jurisprudence and argued based on dicta in Diamond v. Chakrabarty that "anything under the sun" can be patented. Instead, however, these justices agreed with the procedural dismissal and thus avoided making an argument that Metabolite's claim to (as the dissent accurately described it) "any test" combined with a "law of nature" was valid. I find that, although I agree with the substance of the dissent (claim 13 is invalid under section 101 as an attempt to patent a "law of nature," and it's not even a close call), I agree with the majority that this case should be dismissed for failure to properly raise the issue at trial level. Rather than specifically raise section 101, LabCorp engaged in vague hand-waving at the trial level. At the Federal Circuit level it made a 101-type argument and cited some 101 cases, but inexplicably still failed to directly cite section 101! It's grossly unfair and very costly to require already overburdened attorneys to respond to arguments that are poorly researched or amount to vague hand-waving, which is what LabCorp's implied section 101 arguments were here at the trial level and even to some extent at the Federal Circuit. LabCorp's failure to properly raise the issue allowed the Federal Circuit to completely ignore it, so that the Supreme Court was actually analyzing the 101 issue in this case for the first time, without proper fact-finding under section 101 below: something that it should be extremely loathe to do. The classic economic account of the origins of money is that of Carl Menger. Menger described money as emerging out of markets where commodoties were bartered. Barter markets were inefficient, Menger explained, because a double coincidence of wants was required before a trade could be consumated. One way to solve this would be credit, but credit is a very imperfect institution for a variety of reasons. Another way to solve the problem is the intermediate commodity -- a commodity that everybody is willing to take or give in trade. This would start by being an otherwise useful commodity, but eventually it would be come to be valued more, or even entirely, for its monetary attributes (i.e. its attributes as an intermediate commodity, such as durability, divisability, the ability to be securely stored, etc.) Thus would money naturally emerge from the operations of a barter market. Menger's theory is valuable in a number of ways. The coincidence of wants problem is a crucial idea as well as illustrating the Austrian economic ideas of time and subjective preferences. Menger's theory provides a good example of how economic institutions can emerge, it demonstrates that (contrary to modern legal definitions) money need not be created by any sort of government, and it suggests that the emergence of money long predated the invention of coinage. And Menger's theory is true insofar as a barter market would evolve in the way Menger describes. However, as an actual description of the origins of money it is almost surely wrong -- or alternatively, it is even more right than he could have known. This is because money, in the form of collectibles such as shells, predated low transaction cost commodity markets by tens of thousands of years. Money (or, if you prefer to stick to modern legal definitions of money, proto-money which I call "collectibles") emerged far sooner than barter markets because the double coincidence of wants problem occurs not only in barter exchanges, but in other transactions that were as or more important than barter to hunter-gatherer societies: paying tribute, paying legal fines, bride price, and mortuary distribution (inheritance). Furthermore, barter exchanges in these societies usually resembled far more a bilateral monopoly than an efficient market exchange. Use of shell jewelry or similar objects in hunter-gatherer and neolithic societies for these purposes is nearly universal. Nevertheless, in all these kinds of transactions a double (or more) coincidence of wants and events (such as death, marriage, or legal judgment) is required if they are done in-kind rather than with objects with good monetary properties; the best such objects available were usually shells, often strung on necklaces providing secure storage and divisibility. Furthermore, these appeared long enough ago (mature shell jewelry is found now back to 75,000 B.P.) that the (begging) explanation "people collected shells and made jewelry for pleasure" may be backwards -- humans may well have evolved the pleasure of collection because of the evolutionary benefits of greater cooperation. Lowered transaction costs for all these kinds of transactions meant greater familial, political, legal, and economic cooperation -- i.e. the enhancement of kin altruism as well as reciprocal altruism and the mitigation of aggression. I have written about how the productivity of property, and the institutions associated with that property, have tended to be greatly improved when that property was more secure from military and poor quality political intervention (and how these two interventions were often related). Societies dominated by different kinds of property thus have formed different kinds of political and legal structures. For example, modern states whose economies are dominated by the extraction of oil and other minerals tend to have strong governments, and correspondingly less freedom and democracy, especially when (as now) the prices of those mineral deposits are high, probably because mineral extraction tends to be dominated by up-front rather than operational costs, making it easy for governments to expropriate the bulk of the surplus. Although farming dominated most economies until modern times, medieval city republics produced a large number of crucial innovations and had a profound influence on the modern world. Examples included Venice, Genoa, and the Hanseatic League. These republics were focused on cities and their economies were dominated by goods (primarily their storage and transport, but also manufacturing) rather than by farming. As a result, they evolved a set of unique institutions and a unique form of government, the corporate republic. These republics were generally focused on cities that secured their goods, markets, and persons on islands or behind steep mountains. These medieval republics developed a wide variety of institutional innovations, such as insurance and the corporate republican form of government, which are crucial to our modern era. Illustrations: Genoa (top) and Venice (above), foci of the two most extensive, powerful, and innovative city republics of medieval Europe. The non-delegation doctrine is often believed by legal professionals to have been invented by the U.S. Supreme Court in some time in the late nineteenth century. Furthermore, the popular theory goes, the non-delegation doctrine was only enforced by the Court very briefly in a failed attempt to stop the New Deal which broadly delegated economic lawmaking authority to executive and "independent" agencies. In fact, the non-delegation doctrine was well understood by the Founders and extensively debated in early Congresses. Proponents of the non-delegation doctrine observed that Article I put "[a]ll legislative powers herein granted" in the hands of Congress, and thus none of it in the executive branch. Thus, they argued, all important rules should be made by the people's representatives rather than by poorly accountable executive branch employees. James Madison in particular was a proponent of a very strong (by modern standards) version of the non-delegation doctrine. Madison and his colleagues used the doctrine to argue that several Congressional proposals were unconstitutional and thereby defeat the measures in Congress. In the Post Office debate I have chronicled, Madison argued that Congress could not delegate to the United States Post Office the ability to define main post office locations and the broadly stated origins and destinations of the major post roads. He admitted, however, that at some level of detail Congress could constitutionally give discretion to the Post Office to define particular local routes. How far up, in the fractal structure of postal routes, the Post Office could constitutionally be delegated such discretion remained unclear. The outcome of this particular debate was that broad grants of power to generally define offices and routes were unconstitutional, but legislation defining the broad interstate and intrastate routes between major towns and cities, and leaving further detail to the Post Office, was fine. The non-delegation doctrine has remained a slippery doctrine ever since, and since the New Deal has fallen into disuse. We thus now have very broad enabling legislation such as that of the Environment Protection Agency, which grants the agency broad lawmaking authority over "pollutants," including the authority to make rules regarding "any air pollutant from any class or classes of new motor vehicle...[which] may reasonably be anticipated to endanger the public welfare." Thus, argue the plaintiff states and environmental groups in Massachusetts v. EPA, the EPA has the authority to regulate carbon dioxide levels, even though carbon dioxide is not particularly mentioned in the legislation: given the scientific evidence that carbon dioxide causes global warming, carbon dioxide is clearly a "pollutant" that "may reasonably be anticipated to endanger the public welfare." They go on to argue that the EPA further has the legal duty under this legislation to regulate carbon dioxide levels. Even though the Bush Administration has decided that the EPA will not start regulating carbon dioxide emissions, these states and environmental groups are suing for a court order to force the EPA to regulate vehicle carbon dioxide emissions. President Bush's EPA disagrees. It argues (in part by invoking non-delegation doctrine precedents) that this broad language did not grant broad powers over emissions of a ubiquitous molecule that is a necessarily substantial part of life itself. If the harm of carbon dioxide emissions is admitted, literal interpretation of the EPA's enabling statute, would, if it weren't for the above limitation to motor vehicles (and presumably similar limitations to power plants and other industrial activities for similar phrases elsewhere in the stattute) give the EPA power to regulate not only power-plant and car emissions but everything from forest and camp fires to the very air we and our animal friends breathe out of our lungs. Our bodies after all "burn" food calories and the oxygen we breathe in, producing carbon dioxide that we breathe out. Without a non-delegation doctrine, (or alternatively without narrowly interpreting the broad language to exclude such a ubiquitous part of our bodies and the air), a vast amount of lawmaking power woould accrue to the EPA, upon recognition that carbon dioxide is causing somebody, or somebody's property, some harm, without any further initiative by the people or its representatives. Surely Congress did not intend to grant the EPA such broad powers, despite the broad language, the EPA argues (due to the industry-friendly Bush Administration, since it's opposing its own bureaucratic turf interests). The EPA is thus essentially arguing that grants of power should be interpreted narrowly: a principle of least authority should be applied. Madison would have added that even if this is what Congress had intended, Congress is not allowed to delegate such broad lawmaking powers to a non-elected body, just as it could not delegate the broad decisions on where to locate main post offices and major postal routes to the Post Office. Such a vast new area of lawmaking power must be initiated only by the people's representatives, not by unelected bureaucrats. It's not clear whether the Supreme Court, if it decides to hear the appeal in Massachusetts v. EPA, will pay much attention to Madison's non-delegation doctrine. The car industry's brief (intervening on the side of Bush's EPA) dwells on a related phenomenon: given the broad grants of power in modern federal statutes, the regulatory powers of agencies often overlap, and it is this concurrent and thus conflicting lawmaking jurisdiction, rather than grant of lawmaking powers generally, that is improper. Thus, the interventors argue that regulation of carbon dioxide is better classified as regulation of fuel efficiency than as regulation of a pollutant. Thus, it is under the jurisdiction of another regulatory agency, not under the EPA. Furthermore, the states and enviromental groups may lack standing for failing to demonstrate that global warming harms them in particular. As a scientific matter, much of the recent average global warming is highly likely to be related to rising carbon dioxide levels; a jury could find this as an unreviewable (i.e. not clearly in error) matter of fact. But contentions made about global warming as actually causing particular kinds of harm (such as the idea that it is causing more severe storms or bad crop yields in some areas) are highly speculative and probably cannot be reasonably proven in court. Thus, plaintiffs hoping to force the EPA to regulate will probably fail to demonstrate that carbon dioxide is causing them particular harm, and thus will probably fail to establish standing. Both the standing issue and the "no conflicting delegation" version of the non-delegation doctrine may thus prevent this case from reaching the traditional non-delegation doctrine issue. Nevertheless, the proposed massive expansion of the EPA into carbon dioxide regulation, without any Congressional act specifying that the EPA should regulate this ubiquitous molecule, but only harm-causing "pollutants" generally, is a very good example of the kind of thing that Madison was worried about and, for a time, successfully opposed. I have written about how historical forms of political and legal structures have depended on needs to secure property. Recently scholars and writers ranging from Michael L. Ross to Thomas Friedman have pointed out how oil revenue tends to vary inversely with democracy and freedom. Their main theory for this is that oil revenues allow governments to boost their own power and protect themselves from irate citizens. This is particuarly the case when oil prices are high, as now, whereas lower oil prices tend to decrease government power and encourage freedom. Taxing citizens or their more diffuse property directly tends to encourage democracy movements, but pricy oil allows despotisms in today's Venezuala, Russia, Saudi Arabia, Iran, and elsewhere to avoid depending overly on such diffuse taxes for their power. (Historically, democracy tended to emerge, for example in England, by the need for kings to get the "consent" of the realm via Parliament to tax internal property). What these scholars tend not to have focused on, however, is why governments derive so much revenue and power from oil as opposed to manufactured goods, information, or services. The answer lies in the legal uncertanties and the physical insecurity of investments in oil relative to other kinds of taxable property. Private property rights in oil have tended to be problematic, because of the novelty of the industry, because these legal structures were created during an era (early 20th century) when private property was unpopular in most legal circles, and because of the large ratio of initial capital investment to subsequent operating costs needed to extract the oil. All mineral rights give rise to legal problems, due to the interferences (externalities) that occur between mineral rights and rights in the overlying land. Mineral investments tend to be insecure because of the large ratio of initial capital investment in discovery and development to subsequent operating costs. In other words, once the exploration companies do the hard work, it is easy for whoever has the political or military power to come along and steal the benefits. This ratio is far larger for oil in particular than for the farmland which we have seen historically was very dependent on large scale militiaries for protection, and it is high for minerals generally. Once most kinds of minerals, and especially oil, are found, they are far more vulnerable than other kinds of property to political appropriation. Legal uncertainties and the nationalist and socialist traditions surrounding oil encourage this in particular for oil. As a result, most oil deposits around the globe have been nationalized, and even where they have not been nationalized their extraction is usually subject to steep taxation. Michael L. Ross has shown that the inverse relationship between oil and indicia of freedom is "valid and statistically robust" and extends to states rich in other kinds of minerals, which share the large ratio of initial capital investment in discovery and development to subsequent operating costs. The security needs of oil and other mineral property, combined with the unwillingess of governments providing that security to forego the revenue windfall (for example by privatizing oil fields and not steeply taxing them), explains why this is so. Here's my paper on private jurisdiction in English history. Franchise jurisdiction played a crucial but unheralded role in the history of English law and politics. Some private jurisdictions existed in Anglo-Saxon times but they grew in importance in the Norman and Angevin periods, and in the corporate form remained an important part of the British Empire until the 20th century. A franchise, such as a corporation, a jurisdiction, or a right to collect certain tolls or taxes, was a kind of property: an "incorporeal hereditament." English property law was very flexible; as a result franchise jurisdictions came in a wide variety of forms. Franchise jurisdictions included those of manorial courts appurtenant to manors, secular courts appurtenant to ecclesiastical corporations (on top of the Church's own jurisdiction over family law), borough courts appurtenant to municipal corporations, merchant courts appurtenant to markets and fairs, and mining courts apputenant to mines and mining villages. For many substantive areas of law, the king's courts acted only as "night watchmen" courts that reviewed, not the substance of the case, but only whether the courts stayed within their jurisdictional and certain procedural bounds. Generally, the only way to remove or undo the remedy of a franchise court case in royal court was to bring one of several varieties of lawsuits for trespass (tort) against the franchise court. Only if the franchise court was trespassing on the defendant (because it was not acting as a proper legal authority) or trespassing on the jurisdiction of the king or of another franchise court could the case be overturned. Development of the legal authority defense to trespass played a substantial role in developing many modern constitutional rights of procedure, such as the right to a jury trial. Under legal authority for trespass royal courts and officials were treated in basically the same way as franchise courts and officials. Thus, except for this "night watchmen" role of royal courts, where franchise courts and police had exclusive substantive jurisdiction the law operated in a peer-to-peer fashion via property relationships rather than in the hierarchical fashion via principle-agent or master-servant (employer-employee) relationships of imperial Rome and most modern court and police systems. Franchises could also be for jurisdiction over partially or entirely privatized administrative territories such as "hundreds" (often like rural townships) and counties. Broad governmental powers, including almost all, and sometimes more, of the jurisdiction normally granted to royal common law and equity courts, were granted to counties Palatine and many colonial corporations (such as the East India Comany and the American colonies). The results, in terms of civil liberties, were quite varied. In English property law, land tenures and incorporeal hereditaments (including jurisdictions) were either granted or recognized in charters in a form similar to the deeds of modern property law. When the charters involved large amounts of land with appurtenant military services and jurisdictions, they were political as well as economic in nature. These charters were the ancestors both of modern property deeds and of modern state and national constitutions. The Anglo-Norman legal idea of jurisdiction as property and peer-to-peer government clashed with ideas derived from the Roman Empire, via the text of Justinian's legal code and its elaboration in European universities, of sovereignty and totalitarian rule via a master-servant or delegation hierarchy. By the 20th century the Roman idea of hierarchical jurisdiction had largely won, especially in political science where government is often defined on neo-Roman terms as "sovereign" and "a monopoly of force." Our experience with totalitarianism of the 19th and 20th centuries, inspired and enabled by the Roman-derived procedural law and accompanying political structure (and including Napoleon, the Csars, the Kaisers, Communist despots, the Fascists, and the National Socialists), as well as the rise of vast and often oppressive bureaucracies in the "democratic" countries, should cause us to reconsider our commitment to government via master-servant (in modern terms, employer-employee) hierarchy, which is much bettter suited to military organization than to legal organization. Fortunately, franchise jurisdiction has left permanent influences on modern governments, including on the republican form of government in general and the United States Constitution, federalism, and procedural rights in particular. It also left a record of a wide variety of forms of law and government that can provide us with alternatives to the vast employee hierarchies weilding coercive powers that have given rise to modern oppression. Modern civics and political science is often taught as an absurd dichotomy: that government is a "monopoly over the use of force" and that the absence of government is anarchy. Using this fallacious dialectic, many highly lawful societies, such as most of medieval Europe, and in particular medieval and renaissance England, were "anarchies." Even the United States is really an "anarchy": jurisdictions are divided up among federal, state, county, municipal and other entities, including shopping malls and mass transit authorities whose security guards can legally arrest probable criminals. (Some states even still allow "citizen arrest," although it's not recommended that people who don't understand the procedural distinctions between arrest and kidnapping try it). Government does not, and should not, come in the abstract forms taught by high school civics and political science, nor as in the economic models of law that talk about law being enforced by "the government." In medieval and renaissance England (and in many later instances), English jurisdictions were property. The king had granted (as property called a "franchise") much jurisdiction to lords and corporate bodies (such as Church organizations, municipalities, and colonies) but owned the residual jurisdiction of the realm (i.e., all jurisdiction not owned by somebody else). This grant would take the form of a property deed called a charter. A franchise could also be owned by prescription -- i.e. by having exercised the jurisdiction since the English "time out of mind" year for prescriptive property rights, 1189 A.D.
Where franchise courts had exclusive jurisdiction, the king's courts were merely "night watchmen" courts that insured that the franchise courts stayed within their property boundaries, i.e. their jurisdictional and procedural bounds. Medieval and early colonial English courts thus formed more of a "peer-to-peer" system than the hierarchical current (Roman imperial style, or "sovereign") system where "higher courts" generally review both the procedure and substance of judgments in "lower courts." Franchise jurisdictions were defined, by custom or statute or express charter language, by the people and legal subjects over which jurisdiction could be exercised. For example, a merchant court could exercise jurisdiction over merchants doing business at the market fair the court was appurtenant to, and the law it exercised was merchant law. This only had to be consistent with royal law in keeping within its jurisdiction (procedurally as well as territorially): substantively such laws could and often did diverge sharply from royal substantive law. There were dozens of standard jurisdictional franchises. For example, "infangthief" enabled the franchise owner to hang any thief caught red-handed in the franchise territory, whereas "outfangthief" enabled the owner to chase the thief down outside the franchise territory, catch him red-handed, and then hang him. "Gallows" enabled the owner to try and punish any capital crime, and there were a variety of jurisdictions correponding to several classes of lesser offenses. "View of frankpledge" allowed the owner to control a local militia to enforce the law. "The sheriff's pleas" allowed the owner to hear any case that would normally be heard in a county court. There were also franchises that allowed the collection of various tolls and taxes. A corporation was also a franchise, and corporations often held, as appurtenances, jurisdictional franchises. The City of London was and is a corporate franchise. In the Counties Palatine the entire government was privately held, and most of the American Colonies were corporate franchises that held practically all jurisdiction in their territory, sometimes subject to reservations (such as the common law rights of English subjects and the right of the king to collect customs reserved in the American charters). The colonies could in turn grant franchises to local lords (as with the Courts Baron and Courts Leet in early Maryland) and municipalities. American constitutions are largely descended from such charters. In terms of protecting personal liberties, franchises in general and colonial corporations in particular ranged all over the map. Those where Englishmen themselves settled in large numbers, such as the American colonies, tended to be protective and even expansive of liberties, but many other English colonial corporations, from the East India Company (first chartered in the late 16th century) to the Royal South Africa Company (Cecil Rhodes' colonial corporation, chartered in the late 19th century) could be authoritarian and brutal especially to non-Englishmen. Through medieval and renaissance times, and to some extent well into the colonial period, the basic laws of English jurisdiction were property laws. The basic actions (kinds of lawsuit) contesting the jurisdiction or procedure of a court were those of title and trespass. Infringement of jurisdiction was a trespass, and abuse of a defendant by a court (i.e. violating certain common procedural laws) could be a trespass. If any person, including a royal or franchise official, confiscated a person's goods, or imprisoned an individual, or administered some other coercive remedy, he could be sued for trespass. He then had to defend his use of force as a matter of legal authority -- that he had rights as a victim seeking remedy, or rights by owning a jurisdictional franchise, and that he exercised those rights within the personal, substantive, and procedural bounds of the jurisdiction. The king's courts could only reach inside exclusive franchise jurisdictions through the "extraordinary" or "prerogative" writs, which were writs of trespass or title. Thus, where franchise courts held the substantive jurisdiction, the king's courts generally could not review their proceedings for substantive error: only for trespassing on jurisdiction and committing certain procedural defaults, such as depriving a defendant of a right to jury trial. Indeed, many of the procedural rights specified in today's United States Constitution probably have their origins in the legal authority defense required of both franchise and royal courts to exercise coercive process without trespassing on the defendant. David Friedman has described the legal system of medieval Iceland. This was also a peer-to-peer justice system, albeit less specialized and in some ways even more decentralized, and where personal jurisdiction was tied more to choice than to territory. In political science terms medieval Iceland has been called an "anarchy," but it is more realistic to describe it as a very peer-to-peer kind of government, where medieval England was partly peer-to-peer and partly hierarchical, and modern governments tend, on the imperial Roman model, to be quite hierarchical. The Icelandic system was also based on a jurisdictional property, the godord. However, the godord was more a protection service, champion, legal advocate, and executor of the law than a judge. The court of last resort, since Iceland had no king, was the democratic allthing, but it was more than a night-watchman court as it reviewed substance as well as procedure of dispute settlements arbitrated between godord. In our modern system of arbitration, based on choice-of-forum clauses in contracts, personal jurisdiction is based even more on choice, but it is embedded within our imperial Roman style hierarchical and territorial court system that reviews arbitrations for substance as well as procedure, and arbitrators depend on normal governmental entities to execute their judgments: they have no police powers of their own. At the same time as the American Revolution eliminated most titles, it (on top of the early Parliamentarian revolutions) eliminated most franchises, except for certain rigid forms such as municipal corporations which are no longer considered an instance of a franchise. Corporate colonies and Counties Palatine were converted into States. (Actually this process started well before the American Revolution, which was more of a climax to this process). The modern laws of interstate jurisdiction came to be derived largely from international law rather than from franchise property law, and the procedural rights of defendants were encoded in constitutions which succeeded the colonial charters. Today the word "franchise" is typically reserved to official monopolies such as water utilities and jurisdictional and police powers are defined by statute not property grant. The laws of procedure are now based on constitutions and statutes, and the laws of jurisdiction are generally derived from international law (treating for this purpose States as sovereign states) rather than the old franchise law. However, some of the extraordinary writs, such as habeus corpus, survive in the ability of the U.S. Supreme Court to reach into non-Article III courts (e.g. state courts, military courts, etc.) to review their proceedings, usually still on jurisdictional and procedural grounds. I will have much more to say about the "peer-to-peer plus nightwatchmen" model of "government," and the extraordinary writs, in future post(s). I have also describe the actual English system in much more detail, in a paper to be forthcoming.